Helen Fowler O'Gorman, Mexico City. Anon. sale, Christie's, November 20, 1990, lot 19 (illustrated in color). Fondo Editorial de la Plástica Mexicana, Diego Rivera: Pintura de Caballete y Dibujos, Mexico, 1979, no. 182, p. 187 (illustrated in color). Instituto Nacional de Bellas Artes, Dirección General de Publicaciones, Diego Rivera, Catálogo General de Obra de Caballete, Mexico 1989, no. 910, p. 121 (illustrated). Mexico City, Instituto Nacional de Bellas Artes, n/d. New York, Walker's Exhibits, Works of Art from the Private collections of Alumnae Families of the Ethel Walker School, May-June 1998. This poignant work is both a celebration of childhood and Mexico's indigenous people. Rivera frequently employed young childredn as models, such as this little girl and Juanita Rosas, capturing their innocence and charm and immortalizing them as prototypes of Mexican beauty. 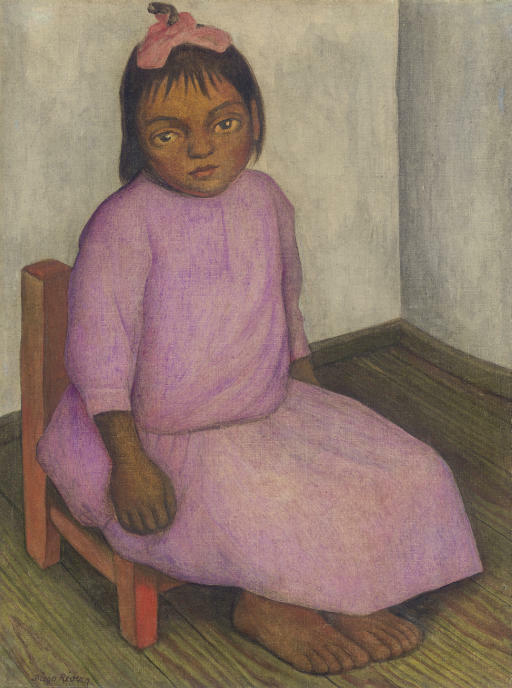 During his entire life Rivera was relentless in depicting the various daily activities of his people or la vida mexicana in all its manifestations whether in monumental works such as his many murals or in small, individual portraits such as this. Rivera received his earliest formal training in Mexico at the Escuela de Artes Plásticas, Academia de San Carlos and the Escuela Nacional de Bellas Artes from 1897 to 1906. In 1907, the artist left for Europe where he remained until 1921. In Spain he studied the work of great masters such as El Greco, Diego Velázquez, and Francisco Goya while in Paris, he became familiar with the Cubist avant-garde and participated in important exhibitions. In 1920, Rivera traveled to Italy with David Alfaro Siqueiros and discovered the work of such Renaissance artists as Giotto, Mantegna and Uccello. The following year, José Vasconcelos, newly appointed Minister of Education, invited the artist back to Mexico and by 1922 Rivera had commenced work on his first mural at the Escuela Nacional Preparatoria, The Creation. Rivera combined in his murals elements such as Cubism, Quattrocento influences, and a celebration of Mexican pre-Columbian history. Rivera remains the most recognized master of the Mexican Muralist Movement, and an important figure in the history of modern art. During his lifetime, he was honored with numerous solo exhibitions internationally including an early show at New York's Museum of Modern Art in 1931. His striking personality and his great talent made him a key figure during the 1920s and 1930s, a decade of cultural effervescence in Mexico.